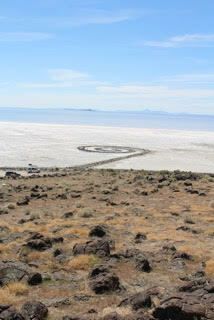 The Spiral Jetty is the signature Earthworks construction of Robert Smithson. 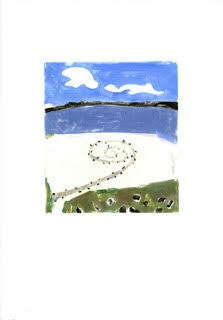 The concept for the Spiral Jetty was bold and cutting edge in 1970. Smithson was a pioneer with the undertaking of the Spiral Jetty, which brought the attention of the art world to the northeast shore of the Great Salt Lake in Utah. Taking I 15 North from Salt Lake City to 84 West the route includes two other historic sites along the way, The Big Fill and Golden Spike. Both are related to the building of the Continental Rail Road. These locations maybe stories for another time. I ate my picnic lunch, took a quick tour of the Golden Spike National Monument Museum and headed out to the Jetty. The road to the Spiral Jetty begins at the south exit of the museum parking lot. It is 15.5 miles of gravel washboard! Bouncing along the road I noticed only two signs indicating direction. One is at 10 miles and another at the nine-mile turn. I drove slowly on the rolling road but still kicked up a lot of dust. There is a tiny view of the Great Salt Lake in the distance. I looked out on the dry and crusty soil, which was once the lake bottom of ancient, prehistoric Lake Bonneville. Weathered cattle grazed on and just off the road. I wondered what took Robert Smithson on this path to a remote location. The road curves suddenly and there is the lakeshore and Rozel Point. 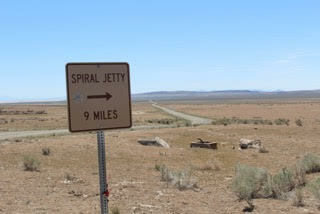 Not far ahead is the Spiral Jetty, and roads end. Pulling over to the right, I park in what has become a roundabout. There are two other cars parked. From one car two women and a baby are heading out to walk the Jetty. From the other car a man is climbing the basalt ridge above. I start up the ridge with my good traveling dog Sadie to get a fuller view. The man is close to the top of the rise and looking up. In the clear, cobalt sky above, huge white pelicans ride in mass on the wind. A sound breaks the silence of the wind. I turn and am startled to see pelicans gliding just above me in V formation, so close it seemed I could touch them. I grab for my camera, but only catch a glimpse as they quickly have become distant and a flash of breathtaking memory. I now have a panoramic view of the Spiral Jetty, The Great Salt Lake, the Wasatch mountains to the east, and the cobalt-blue sky. The view and the silence. I feel my breath shift with the rhythm the of natural environment. A slow deep breath of renewal, peace, and of connection to place. There is a plaque on the rise above the Jetty provided by Eagle Scouts with information about the Spiral Jetty. It tells of artist, Robert Smithson (1935-1973). He died so young. The plaque says that the Spiral Jetty is a 1,500-foot long coil, is 15 feet wide and constructed only of earth, salt crystals, basalt rocks and water. It says that sometimes the earthworks sculpture is submerged in the water of the lake. I have read that for much of its existence it has been submerged. The Spiral is in a continual process of erosion and returning to earth as it was meant to. The Spiral Jetty is now a skeleton of what was constructed 45 years ago in April 1970. I am visiting April 29, 2015. As I stand above the Spiral Jetty I do some quick drawings, reference for later. And from this view I feel the spirit and energy of Robert Smithson. He took his concept of environmental earthwork and dug into its application and construction. It is a signature statement reflecting the shape shifting of nature. The symbol of the spiral has many meanings. The most prominent is a marker for water. Throughout the ancient symbolism of the southwest people is the spiral indicating the location, or a path to water in the area. The coil or spiral also represented the whirlwind, the breath of life, breathing in and out; transition, and fluid movement on the physical and spiritual level. Spirals were used to mark the seasonal movement of the sun, or ascendance, emergence, submergence. For ancient artists the spiral was site specific, a powerful symbol of connection to the pulse of the natural world. For Robert Smithson, too, the spiral connects the young artist to the spirit and soul of the raw environment and to the ancient artists of the southwest in the millennium of time. Sadie and I cross the parking area to walk the eroding skeleton of the Spiral Jetty. The women and baby are now returning on the winding corkscrew path. 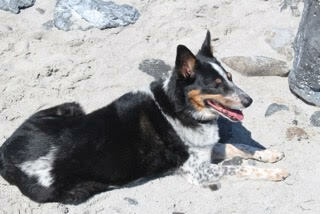 Sadie pauses to rest on the basalt and salty sand. Then we continue to the vortex of our daytrip, the center of the coil. It has been a beautiful and peaceful day, connecting to the Spiral Jetty and place. We return to the car and slowly bounce along the washboard road. I pull over once again to allow the women with baby to pass. The up and down of the road, long views, and emptiness of the landscape on return are so appealing. Approaching the dusty cattle again, I see cowboys in an old pickup hauling water to the cows. I creep along. Soon the old pickup is behind me on the road. I pull over to let them pass and notice on a narrow hitch between the truck and water trailer are balanced two cattle dogs. They look a lot like Sadie who is now sleeping in the back of the car. The cowboys nod in passing. I realize in leaving why Robert Smithson constructed his Spiral Jetty sculpture at the end of a gravel road on the remote northeast shore of the Great Salt Lake. The remote location of the Spiral Jetty allows an intimate experience and awareness of the unfolding of a remarkable day, a day that could be any day. I am touched by what is called The Smithson Effect.